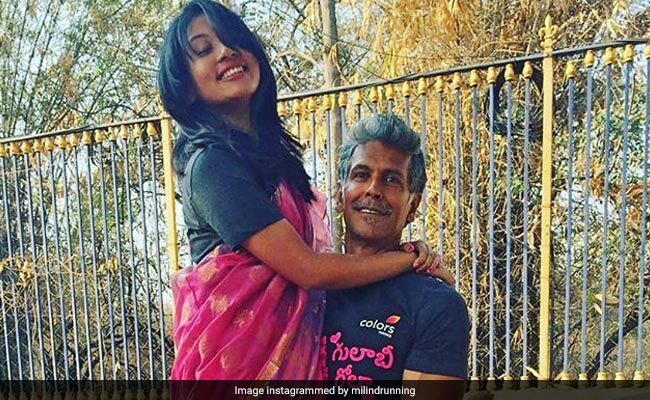 Milind also added the hashtags "#GettingThere"and "#keepsmiling"
Milind Soman's latest Instagram post for wife Ankita Konwar is proof of why we just can't seem to get enough of this lovely couple. Milind Soman shared the sweetest message for his wife on their six-month anniversary, which is sending the Internet into a meltdown. "Sweetheart, it's been six months, the happiest learning how to be the best husband to the sweetest wife," Milind captioned the photo featuring Ankita. Milind also added the hashtags "#GettingThere"and "#keepsmiling". Milind Soman's post for Ankita perfectly encapsulates the very essence of his relationship with his wife. Milind's Instafam showered love for the couple in the comments section. Milind Soman married Ankita Konwar in April 2018. The couple opted for a traditional Maharashtrian ceremony in Alibaug. The wedding took place in the presence of family members and some close friends. A few months later, the couple posted pictures from their "barefoot wedding" which took place in Spain. Milind Soman is often seen documenting his love for wife Ankita on social media. Remember Milind's adorable post for his wife on her birthday? Or the throwback picture from when they met at a club in Chennai in 2014? On the work front, Milind Soman currently features as a judge on the fourth season of television reality show India's Next Top Model. He has featured in films like Chef, Bajirao Mastani and 16 December.